Whatever else may be said of Demon Knights after it ends its' run in two months time, no one will deny that the series aimed high. 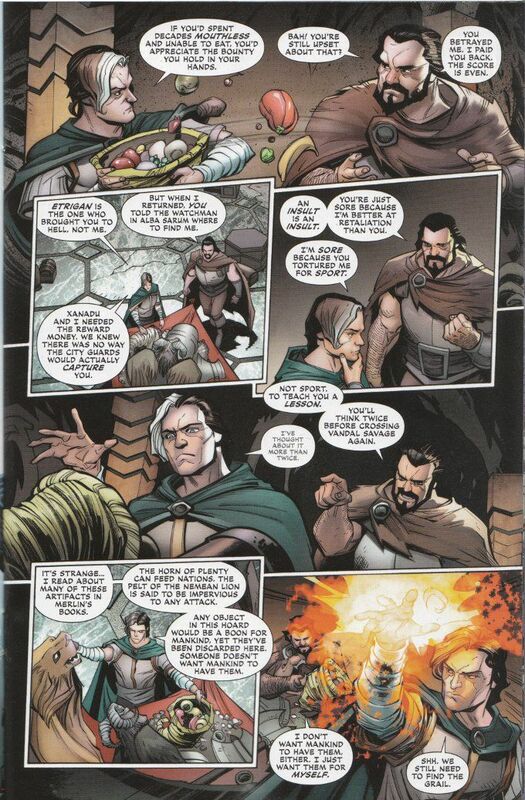 Though I fear Robert Venditti's scripts lack the wit of Paul Cornell's (the humor in this issue being limited to a few dry remarks between Vandal Savage and Jason Blood) I cannot accuse Venditti of cowardice in shying away from the more controversial aspects of the series. 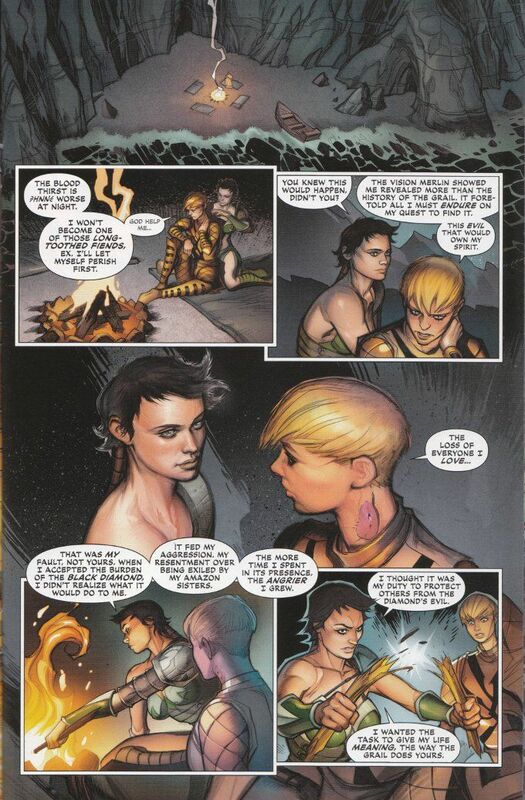 The romance between the transgender Sir Ystin and exiled Amazon Exoristos could easily have been abandoned in the 30-year gap between story-lines and Venditti deserves credit for continuing to explore this character thread. The artwork is more problematic, with inker Wayne Faucher proving the dangers a second inker can do to a book in ruining it's uniformity. This first scan above depicts the artwork as pencilled by Chad Hardin with Hardin providing his own inks. This work looks more stylized but it is a style that I think fits the story, seeming somewhat ethereal in how lightly it is shaded. The scan below shows Faucher's work, which ruins much of the stylization of Hardin's pencils, placing everything within a standard outline. I will miss Demon Knights once it is gone. This book was one of the hidden treasures of The New 52. That being said, I suspect that when I think of this series in the future and reread it I may find myself skipping over these issues towards the end.